I ask God to give me one word or picture for every year. This year I have a word and a phrase. 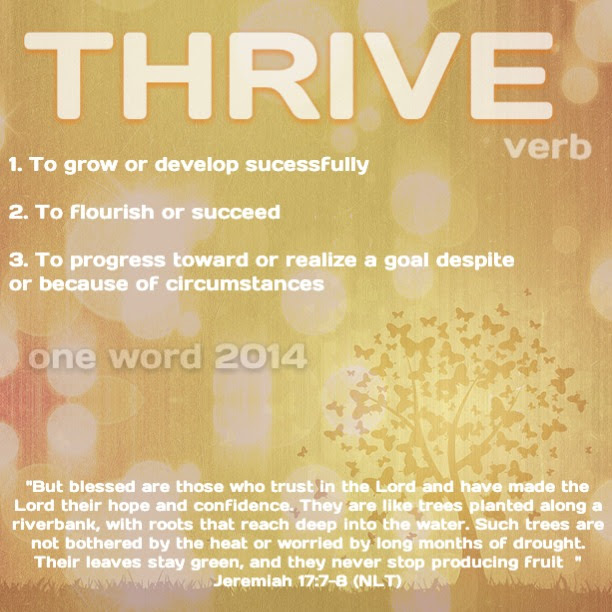 My word God gave me this year (as seen above) is “Thrive”. Two years ago I was told that, “His deep is crying out to your deep,” and I thought I knew what it meant, but I had not fully grasped what it was. Then last spring, it hit me. We walk in the depths that we allow God to heal in our lives and the depths that we allow His fullness to go. All last year the depths of my heart have been responding to the call from the depths of His, and level by level restoring the places in my deep that before I had not allowed to be touched. There is more for me yet, and His depths continue to cry out to mine…and in mine responding, there is a vastness and beauty in the deep that is created when our depths meet. It is in those deep places mixing with His that I can walk in the depths of who He is. With that being said, it gives me an outlook as to what my life looks like. Walking in the depths that I do, what then does my life for the gospel look like? My life for the gospel looks like invading the low and dark places that only the broken and shamed are found. The victims, the abused, the prostitutes, the emotionally devastated, the hopeless, the runaway, the lost – the broken. The disillusioned who don’t know their worth after what they have been stripped down to what they see as nothing, but they know and have the thought that they were worth more than this. My life for the gospel looks like loving the unloved and battered women and girls. To reach and hold the ones taken…the ones which innocence has been torn away. My life for the gospel looks like reaching into the dark places of a broken soul for the light the enemy has tried to steal from them. My life for the gospel brings a restoration to the broken and a recognition of redemption. 2013 was a year of going deeper and searching the deep things of God. 2014 is my year to thrive. I cannot feed people from my roots – that is my faith, testimony and my experiences – but they can be fed by my fruit. And it is the fruit will reveal what is in the roots. I cannot wait to see what God has in store for this next year. I am now just 5 days away from my new site launch date! On January 6th this blog will discontinue and my new site will take its place. My new site features the phrase that God has laid on my heart – Graced with Glory. I hope you continue to keep up with me there. Wishing you the best in 2014. May your year be blessed and may you walk in the favor of God. Do you have one word or a picture for 2014? Please share in the comments below! “New-normal” – both me and a dear friend of mine share this word for 2014… The New Normal. What I have to face, I believe, is easier than what she has to face. Life without her oldest child, who passed right before Thanksgiving. I began suffering medical problems a few days before her son died. Anyway… My new normal will be diet changes to prevent me from having to suffer the worst of this medical condition again. Also to be less involved outside of home and my personal life, i.e. the service and assistance I was providing is no longer needed. The sun still comes up whether I’m “there” or not. Good for those people, and myself, to know. The word: Trust. I have made this Bible verse my theme verse for 2014.